ISIS Europe visited the EU Development Days event in Brussels. Organised by the European Commission, the event brings together development workers looks to build a consensus on a development agenda post 2015. ISIS attended the panel discussion entitled Post 2015: Objective Peace, the search for sustained solutions to fragility, conflict and violence from 2015. With the Millennium Development Goals (MDG) ending in 2015 the development community is looked to define the next set of goalposts. 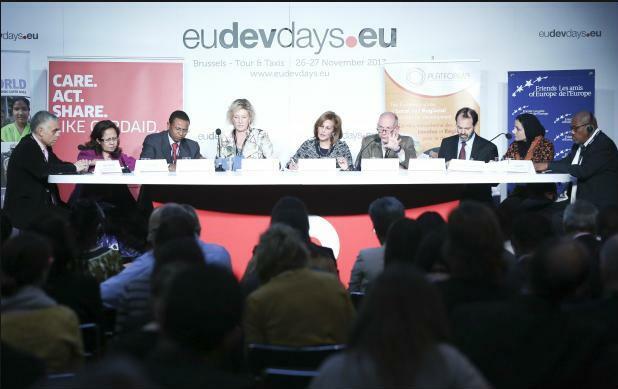 The panel was chaired by Shada Islam, Director of Policy, Friends of Europe. She introduced the topic, explaining that 1.5 billion people live in conflict affected and fragile states and there is a consensus that development cannot take place in these situations. There is an emerging understanding that development must tackle the root causes of conflict. Drivers of conflict were beginning to be given priority when it came to tackling development issues. Marcus Cornaro, Deputy Director General, Directorate-General for Development & Cooperation, EuropeAid spoke about the recent common frameworks that were being established to deal with statebuiliding, including the ‘New Deal’ for fragile states as being a step in the right direction. Areas such as Security Sector Reform (SSR), transnational crime and migration had to become a focus of development in order to tackle the drivers of conflict. These approaches required a strong sense of community ownership if they were to be successful. Alex Their, Assistant to the Administrator Bureau for Policy, Planning and Learning, USAID, believed that it was a truly transformative period for development, with the end of the MDG focusing minds and the high level of resources available to tackle development issues. He believed strongly in the ‘New Deal’ as country leadership crucial for sustainability. He agreed that mutual accountability was critical; donors had to be accountable for their approaches and their choices in distributing resources whilst partners had to be accountable for correct use of delivered resources. Mr. Their believed that good governance distinguishes success from failure. It was never too early to start building institutions as they had long term benefits. Emilia Pires, Minister for Finance of Timor-Leste spoke extensively about the experiences from her country that would be applicable to a post 2015 agenda. She believed sustainability was not always key in post-conflict environments, citing the example of overspending to provide electricity in Timor-Leste that subsequently allowed the government to gain legitimacy and the required time to sufficiently rebuild. As finance minister she had taken risks that donors should also consider, believing that donors often forgot the human aspect to development problems, and that sometimes citizens had to be trusted. Any work must be country led and owned; if capacity and leadership were not available then donors should provide it, but through the government and not the donors as this helped to legitimize them rather than undermine, suggesting that experts should be seconded and report to national governments rather than their agencies. Maciej Popowski, Deputy Secretary General, European External Action Service spoke of the EU’s objective to focus on the security-development nexus. He believed that there was poor dialogue between development and security actors and bringing them together through integrated planning was the key to success. Building institutions was imperative but security institutions needed to be accountable and inclusive and culturally sensitive, built with members form all backgrounds and sides of the conflict. Two issues stood out as problematic in reaching a post 2015 consensus. The first is trying to reconcile the need for local ownership and organic growth of countries institutions and civil societies with resource accountability. Results based management and strict monitoring of budgets restricts the ability to implement longer term, more conceptual development. Donors want value for money and must account for every Dollar or Euro, whist practitioners long for a more organic and long term view. Local ownership cannot happen if they are not trusted with resources but donors are unwilling or unable to risk such resources. Bridging this gap that allows mutual accountability seems to be crucial. The second issue which was barely touched upon by the panel is development organizations relationship with security providers. The entire panel were in agreement that development cannot happen whilst there is conflict, but little thought was given on how interactions with security providers can benefit long term development. The institutional difference between development and military ethos’s are incredibly difficult to bridge but there can be no talk of post 2015 agendas on peace and security in development if practitioners do not plan and engage with the those capable of providing security. The comprehensive approach requires input and planning from all actors. Development organizations seem detached from this reality and must engage now for a post 2015 consensus to successfully find sustained solutions to fragility, conflict and violence. Pingback: Post 2015 Objective Peace: Development and Insecurity | Post2015.org - what comes after the MDGs? This entry was posted on 27/11/2013 by ISIS Europe in Conferences, Nic Watkins and tagged CSDP, Defence, Defense, Democratisation, Development, EEAS, EU, EU Crisis Management, EU Foreign Policy, EU Institutional Reform & Oversight, Europeanisation. Democratisation, Gender & Security, intervention, MDG, millennium development goals, post 2015, security, SSR, United Nations.